This is an excellent storm shell for active users. 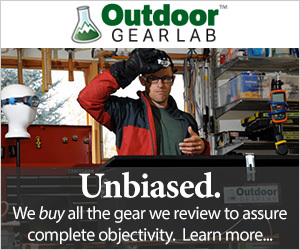 Outdoor Research is cutting the Clairvoyant from their lineup this year. The Outdoor Research Clairvoyant is a light and flexible hardshell jacket that feels almost like wearing a sweatshirt. It is made of the most lightweight and breathable Gore-Tex Active 3-layer material, which is excellent for more aerobic pursuits. We loved this jacket for ski touring in the Pacific Northwest. The shorter torso length and pocket designs were not as ideal for climbing, but for most high energy mountain sports, this is an excellent choice. The Outdoor Research Clairvoyant feels more like a softshell than a hardshell but provides all of the benefits of 3 layer Gore-Tex shell protection. This is an exceptional hardshell for aerobic activities that still require burly storm protection. And with a very affordable price point, we awarded this impressively versatile hardshell our Best Buy Award. Exploring a defunct ski lift near Bozeman, Montana. The Clairvoyant is an excellent hard shell for aerobic activities in cold weather. The Clairvoyant is made of 3-layer Gore-Tex Active fabric, the most lightweight and breathable of their 3-layer technologies. This may not be the layer you want for a Denali expedition, but for shorter trips in slightly milder climates—and with lower consequences, perhaps—this is an excellent choice. In our tests, this jacket felt similar to the Arc'teryx Beta SL, even though it's made of 2-layer PacLite (which is a testament to the impeccable design characteristics of Arc'teryx jackets). The Clairvoyant is burly with an athletic fit that facilitates breathability. The Clairvoyant is slightly on the shorter end of torso/back lengths, coming in one inch shorter than the Beta SL, for which it received a small penalty in the weatherproof tests. This shorter length can feel more comfortable, but if it's too short for you, it might let in drafts and errant snowflakes on windy days. The many looks of the Clairvoyant. The hood has the standard three adjustment points, and an excellent brim with trim that cinches around the face. The cuffs are simple velcro, and the waist features a single drawcord adjustment point which is simple and saves a little weight, which we liked. The Clairvoyant has a very soft hand and a more athletic fit which made it one of our favorite jackets for higher output aerobic mountain sports and technical climbing. It has no pit zips, which we think improves the way the arms articulate for things like ice and mixed climbing. The hood also benefits from the suppleness of the fabric, as well as the three cinch points—this jacket turned with our head and helmet rather than letting us turn our head inside the hood and ending up with a view of the inside of the hood instead of the scenic landscape around us. Cool weather hikes are a great activity for the Clairvoyant, but it also holds up for much more technical adventures. The Active line of Gore-Tex used in this jacket is an excellent choice for a light, breathable hardshell that still needs to be made of the most rugged 3-layer Gore-Tex. The Clairvoyant arms were a little short, making it less ideal for climbing where your hands are over your head. The gusseted underarms and raglan sleeves also provide an excellent range of motion for the arms of this jacket and is a much more natural design to employ on jackets without pit zips, so we were delighted to see it here. With gloves, we could still seal out the elements, despite the shorter arm length on the Clairvoyant. Gore-Tex Active is the most lightweight and breathable of the 3-layer fabrics they offer. To go any more lightweight, we would only have the 2-layer PacLite material to turn to. This line of Active fabric is the most breathable 3-layer fabric we tested, and we loved it. There are no vents or pit zips in this jacket, but with an athletic fit, we felt we didn't need it. This closer fit means that the fabric is closer to your body heat, and it is thus easier to pump moisture out of the jacket. The athletic, slim fit of the Clairvoyant makes it easier for your body heat to pump out excess moisture, but harder to layer warm clothing underneath. As such, this jacket is better suited to milder climates or high energy activities. The more slim fit also limits the number of warm layers you can wear under the jacket, so this is not the burly expedition hunker-down-and-wait-out-the-storm layer that can fit over your down parka. It is, however, exceptional for cold weather activities. We liked it for stop-and-go sports like ice climbing. We could climb with thin but warm layers underneath, just enough to be warm on our climb, and have this jacket fed of errant ice chunks, spindrift, and dripping sections of ice—then we could throw a parka on over it all once we arrived at the belay. This is the second lightest hardshell jacket in this review, at an impressive 7.5 ounces for a small jacket. It is the lightest 3-layer jacket in the review, however, outcompeted only by the Arc'teryx Beta SL which uses the much lighter 2-layer Gore-Tex Paclite. This jacket is a little bit shorter, however than the Beta SL and AR, as well as our Editors' Choice winner the Norrona Trollveggen, which offers a little weight savings. This does detract slightly from its weatherproofness, versatility, and climbing utility. But it might feel more comfortable for everyday use, or if you don't need to wear it with a harness. The Clairvoyant has our favorite feature: the chest pocket. However, we can't say we're fans, as it's not big enough for some smartphones. That said, this is probably for the best because that chest pocket's zipper is on the outside of the jacket and it is not waterproof. That's a slightly bigger fail. The jacket also has two hand pockets, but again no waterproof zippers. These pockets are a little bit lower on the torso, which means if you intend to use this model for climbing, they can get stuck under a harness. The torso length is a bit shorter, and the jacket would benefit from a bit more length to remain secure under a harness. If this is not a jacket you want for snow or ice climbing pursuits wearing a harness, these details may be moot. We love chest pockets, but this one was too small to get a smartphone into, and without a waterproof zipper on the outside of the jacket, don't put anything that can't get wet in it! The hood has excellent adjustability with three drawcords, and we liked the single adjustment point at the waist—totally adequate, simple, and saves a little weight. We also love when a jacket doesn't make it hard or uncomfortable (or impossible) to look around and enjoy the view. The Gore-Tex Active prioritizes light weight and breathability over rugged durability, but we still found the durability to be perfectly adequate for most mountain uses. We wouldn't be as psyched to take this on a high altitude expedition, but for mid-mountain use, and most winter adventures, it is totally up to par. The athletic fit keeps the material closer to your body, and we often find this helps reduce abrasion and the chances of snagging on a sharp rock (or sharp tools) when climbing mixed routes. Holes and scrapes are great ways to force a jacket into retirement. The 3 layer Gore-Tex Active material is light and breathable and looks and feels almost like a sweatshirt. The rest of the features on the jacket are very solidly made. The zippers are durable plastic, which we love, but they're not waterproof, so that wasn't our favorite feature. The Clairvoyant is an incredibly versatile hardshell jacket, with its upper limit being high altitude expeditions: this is probably not the jacket for Denali, and maybe not Aconcagua either. But for mid-mountain adventures, mid-winter aerobic activities, and technical climbs, this is an excellent choice. The range of motion is outstanding, and the impressive light weight, best for 3-layer jackets in this review, makes it an easy addition to your winter ski touring kit as well as your summer mountaineering equipment. This is a layer for many occasions. We liked it most for activities that required a high range of motion: ice climbing, for example. It is also a great choice for high output aerobic activities like ski mountaineering. It provides excellent storm protection when the weather turns, and breathes well enough for the lower elevations where it is warmer and milder—so it can keep pace through a variety of conditions, even if those conditions all happen in a matter of hours on the same ski tour or ice climb! The Clairvoyant is our unequivocal Best Buy winner. It is not the cheapest jacket in the review, which might cause you to pause. The Arc'teryx Beta SL is more affordable, but for a Best Buy, we wanted a jacket that provides a solid all-around feature set. This was the obvious pick. It is made of 3-layer Gore-Tex, whereas the Beta SL is 2-layer PacLite and is a little less durable, and slightly less burly if you want to stretch its limits into the higher mountains. The Clairvoyant, therefore, is an excellent, affordable, all around model that will easily hold up and keep up with a wide range of mountain adventures and conditions. This is not the best for use with a harness, so if you're looking for something to wear for ice, snow, mixed, and glacier climbing, this may not be your top pick. The Outdoor Research Clairvoyant is an excellent hardshell for active pursuits. This is a great shell for ski touring and ice climbing, where mobility and breathability are key, but you really can't compromise weather protection. This jacket is less durable than the burliest, severe weather hardshells, and likely not your best companion for expeditions and polar environments, but for most activities in most mountain ranges, this is an excellent choice. It is also very affordable, especially for a fully featured 3-layer Gore-Tex jacket. This is a jacket that will hold up to a broad range of activities, for a lot of adventures, especially if well cared for. You can look forward to many adventures in the OR Clairvoyant. MooseJaw $210.99 - 35% off!